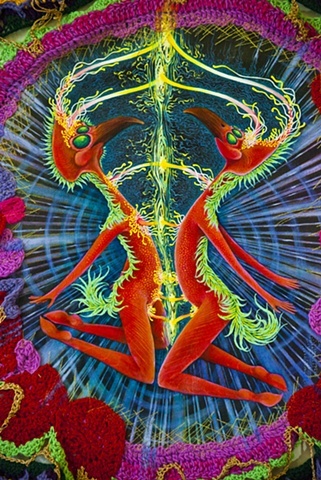 I was asked to come up with an image of alien sexuality for a book titled "Strange Attractors: Investigations in Non-Humanoid Extraterrestrial Sexuality." This was what I came up with. The book is an amazing collection of art and video on the topic and I am so excited to be included in the volume. The original painting is oil on canvas with a crochet border, which once hung on the wall, gives the illusion that it is a flayed hide, stretched out to dry. You can see some of the crochet detailing in the photo.